It is to be well noted that the Great Women of History have exercised unbounded freedom in Love. The ‘company of heaven’ is Mankind, and its ‘unveiling’ is the assertion of the independent godhead of every man and every woman! This is the anniversary of the day on which Chapter III of Liber XXXI, the manuscript of what would become Liber AL vel Legis, Book of the Law, was received in a magical working by Aleister Crowley and Rose Kelly in 1904. This is the anniversary of the day on which Chapter I of Liber XXXI, the manuscript of what would become Liber AL vel Legis, Book of the Law, was received in a magical working by Aleister Crowley and Rose Kelly in 1904. 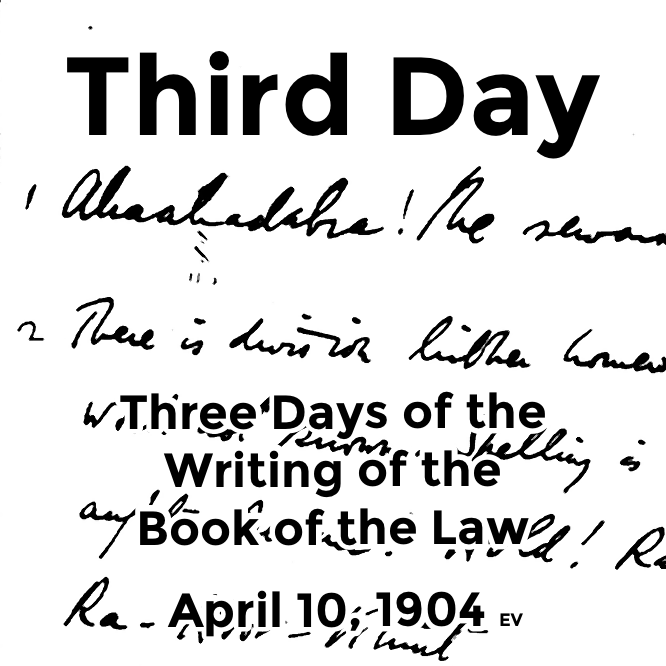 The Third Day of the Three Days of the Writing of the Book of the Law, April 8, 1904 for this Thelemic Holy Day in An. Vii. This is the anniversary of the day on which Chapter III of Liber XXXI, the manuscript of what would become Liber AL vel Legis, Book of the Law, was received in a magical working by Aleister Crowley and Rose Kelly in 1904. 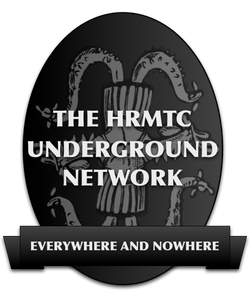 This entry was posted in The Hermetic Library and tagged aleister crowley, Book of the Law, calendar, holy day, liber al vel legis, liber xxxi, Ra-Hoor-Khuit, Rose Kelly, three days of the writing of the book of the law on April 10, 2017 by John Griogair Bell. 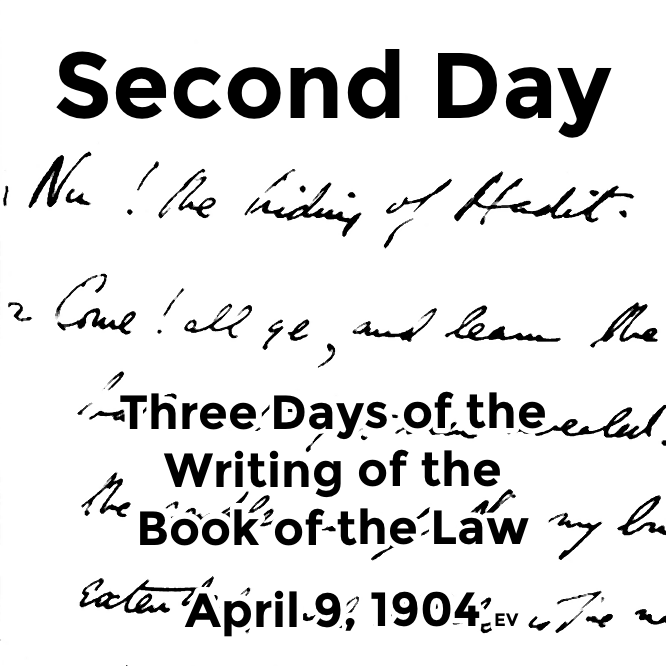 The Second Day of the Three Days of the Writing of the Book of the Law, April 9, 1904 for this Thelemic Holy Day in An. Vii. 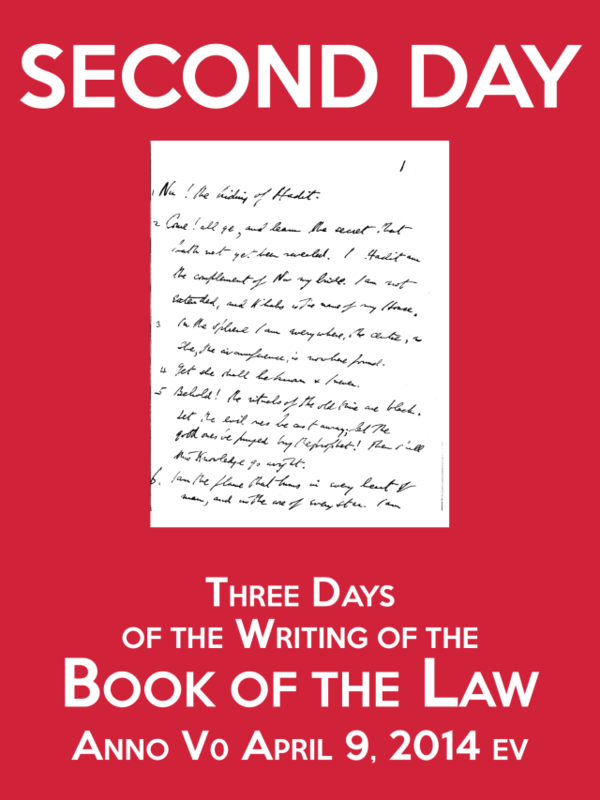 This is the anniversary of the day on which Chapter II of Liber XXXI, the manuscript of what would become Liber AL vel Legis, Book of the Law, was received in a magical working by Aleister Crowley and Rose Kelly in 1904. 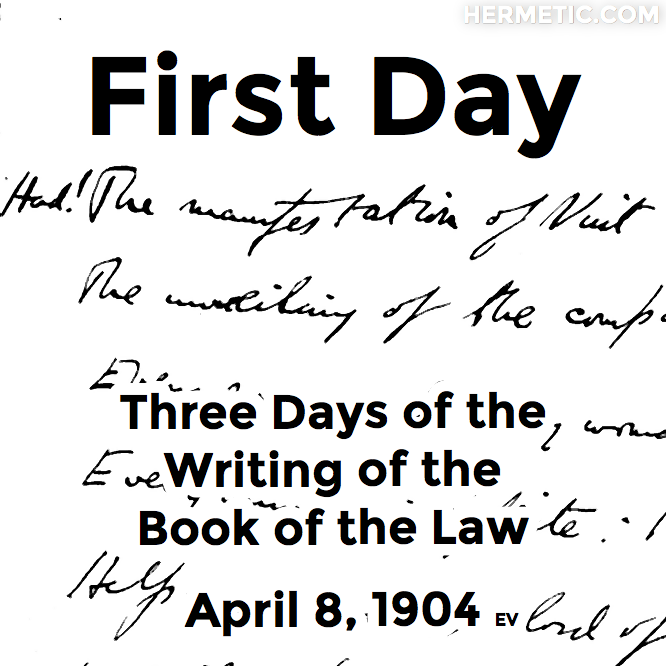 The First Day of the Three Days of the Writing of the Book of the Law, April 8, 1904 for this Thelemic Holy Day in An. Vii. This is the anniversary of the day on which Chapter I of Liber XXXI, the manuscript of what would become Liber AL vel Legis, Book of the Law, was received in a magical working by Aleister Crowley and Rose Kelly in 1904. “Liber AL vel Legis, Chapter 1” is a collborative track from Sekhet-Maat in Portland, OR added by Frater M.P.D. in the Hermetic Library audio pool. Group reading by Sekhet-Maat Lodge. Project conceived and recorded by Soror Theodora. Music and production by Frater M.P.D. 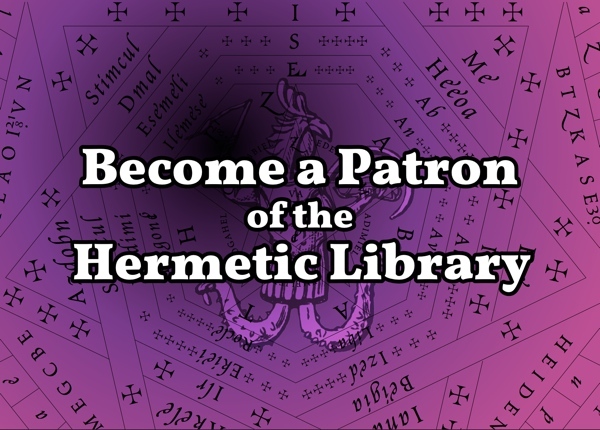 This entry was posted in Hermetic Library audio, Liber Legis - The Book of the Law and tagged audio, Book of the Law, Frater M.P.D., liber al vel legis, music, OR, Portland, Sekhet-Maat Lodge, Soror Theodora, spoken word on May 27, 2014 by John Griogair Bell. 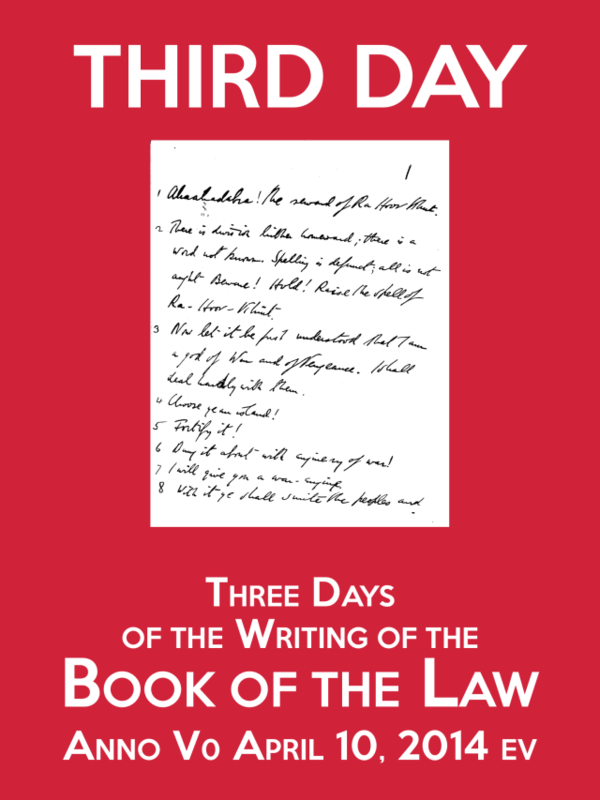 This Third Day of the Three Days of the Writing of the Book of the Law Poster is helpful propaganda from the Hermetic Library Office of the Ministry of Information … for this Thelemic Holy Day in Anno V0. 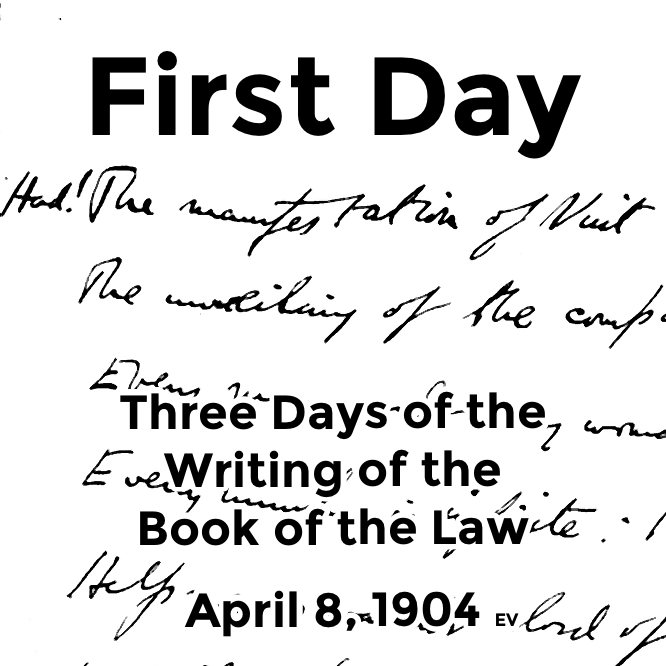 This is the anniversary of the day on which Chapter III of Liber XXXI, the manuscript of what would become Liber AL vel Legis, Book of the Law, was received in a magical working by Aleister Crowley and Rose Kelly in 1904 EV. This entry was posted in Liber Legis - The Book of the Law, The Hermetic Library, The Libri of Aleister Crowley, Thelema and tagged 1904, 2014, aleister crowley, Book of the Law, calendar, events, holy days, liber al vel legis, Rose Kelly, thelema, three days of the writing of the book of the law on April 10, 2014 by John Griogair Bell. 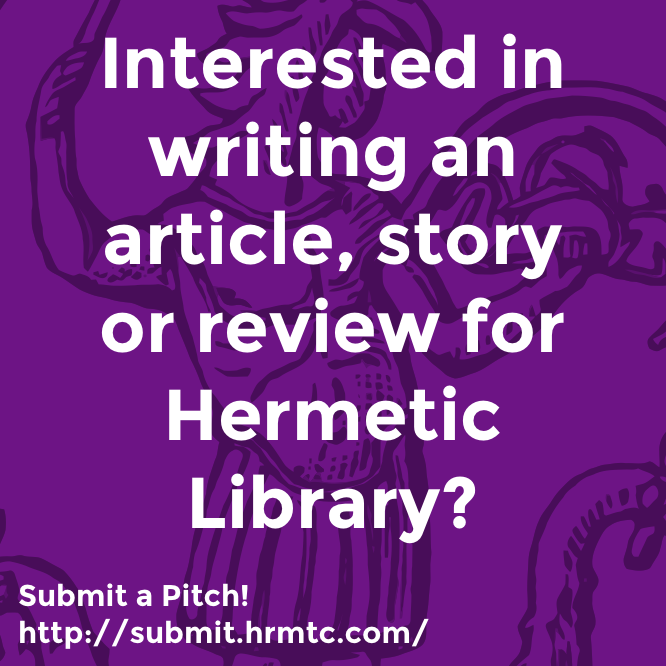 This Second Day of the Three Days of the Writing of the Book of the Law Poster is helpful propaganda from the Hermetic Library Office of the Ministry of Information … for this Thelemic Holy Day in Anno V0. This is the anniversary of the day on which Chapter II of Liber XXXI, the manuscript of what would become Liber AL vel Legis, Book of the Law, was received in a magical working by Aleister Crowley and Rose Kelly in 1904 EV. This entry was posted in Liber Legis - The Book of the Law, The Hermetic Library, The Libri of Aleister Crowley, Thelema and tagged 1904, 2014, aleister crowley, Book of the Law, calendar, events, holy days, liber al vel legis, Rose Kelly, thelema, three days of the writing of the book of the law on April 9, 2014 by John Griogair Bell.